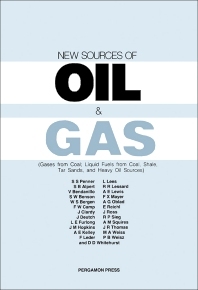 New Sources of Oil & Gas: Gases from Coal, Liquid Fuels from Coal, Shale Tar Sands, and Heavy Oil Sources is a collection of papers that covers various concerns in exploiting alternative sources of oil and gas. The book first covers the essential features of developing coal-gasification and coal-liquefaction technologies, and then proceeds to discussing the results of a detailed evaluation of technologies for shale-oil recovery. The last article discusses the assessment of research areas that affect the prospects for oil recovery from oil sources and tar sands. The book will be of great use to researchers and practitioners of disciplines involved in the fuel industry.